The concept of Collagen Induction (CIT) is based on the skin’s own ability to repair itself. Treatments with the derma CIT Pen allow for controlled induction of the skin’s self-repair process by creating precise, micro injuries in the skin which creates and stimulates the release of growth factors to trigger the production of new collagen & elastin. 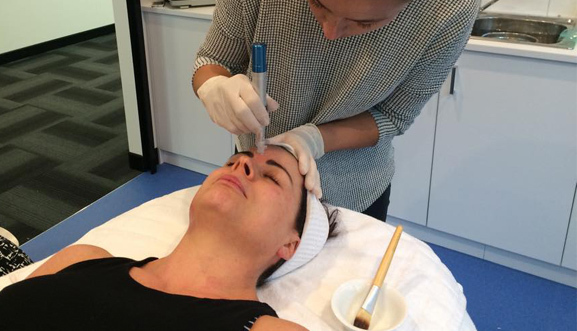 What is a derma CIT Pen? The derma CIT Pen is a non-surgical, cosmetic micro-needling device that is used in treatments to improve the appearance of your skin. It is a non-invasive treatment that takes your skin to the next level of health and appearance. derma CIT treatments target fine lines & wrinkles, skin texture & tone, loose & sluggish skin, enlarged pores, acne scarring and pigmentation. This device has been designed by derma aesthetics with your safety & comfort in mind. Single-use sterile micro-needle cartridges are supplied for each treatment and patented technology ensures there is no cross contamination. Strengthen a fragile capillary network. Encourage and regenerate collagen and elastin to improve skins overall structure, function and appearance. What areas of the body can I have treated? Because of the derma CIT Pen’s variable needle depths, it can be used on most body parts, including the face, neck, décolletage, hands, stomach, legs and arms. Am I a good candidate for CIT? As with any treatment, there are always contraindications and precautions that should be taken into consideration before proceeding. Your skin treatment therapist will go through a detailed evaluation to ensure the treatment will be safe and effective for you. Be honest in this evaluation, for your own benefit. Presence of raised moles, warts or lesions in the treatment area. Botox in the past 2 weeks. How long does a derma CIT treatment typically take? The procedure typically takes 30 – 45 minutes in-clinic. A topical anaesthetic may be applied prior to your treatment if necessary. You may need to add a little extra time if topical anaesthetic is used. Immediately after the treatment your skin will most likely be red and flushed (similar in appearance to a mild sunburn). You may also experience skin tightness and slight sensitivity to touch on the area being treated. This will reduce over the following few hours after your treatment and will have completely subsided by the next day. You may experience slight redness for a few days post-treatment. 3 to 5 days after your treatment, your skin is likely to feel a little dry and be flaky in some areas. This is due to the fast cellular turn over post treatment. When should I expect to see visible results? Visible results are evident between 5 to 8 weeks post your derma CIT treatment. However one of the most exciting things about CIT is that your results will continue to improve over the next 12 months as the new collagen and elastin settles, strengthens and rejuvenates your skin from within. Results will vary from person to person, but to give your skin the best results, the correct topical skincare prior to the commencement of your course of CIT is vital. Each person’s skin conditions are different and require differing levels of treatment. Your skin treatment therapist will determine the number of treatments to undergo. The number of treatments will be determined by your skin goals (i.e. erase visible pigmentation) and also by the health of your skin, making it important to prepare your skin prior to your first derma CIT treatment. As a general rule 3 to 5 treatments, every 6-8 weeks are preformed to achieve optimal results. You will then be given a maintenance plan to sustain your results. What is a derma CIT & LED treatment? This is a combined treatment with derma CIT and Light Emitting Diodes (LED). LED use post-treatment will speed up recovery, reduce inflammation and provide additional benefits over derma CIT alone. What skincare should I use before, during and after my CIT treatments? This is one of the most important questions you should be asking your therapist prior to your treatments. Most skincare lines have not been formulated with Collagen Induction Therapy in mind. Our outer most layer of skin is a protective barrier that does not allow your skincare products to penetrate, however derma CIT treatments create fine micro-channels that allows your skincare to penetrate. Ensure your skincare has a physiological composition and does not contain Alpha Hydroxy Acids’s, Beta Hydroxy Acids’s, perfumes, emulsifiers, colours, silicones and mineral oils. dermaviduals has been created with CIT in mind and is the most highly recommended dermatological skincare range to be used before, during and after derma CIT treatments. Can I wear makeup immediately after my treatment? You can typically resume your normal makeup regimen the day after your derma CIT treatment. If you feel you that you must apply makeup to conceal redness, it is important to wait a minimum of 30 minutes post-treatment. Ensure your makeup is a clean, physiological preparation. We recommend using the dermaviduals deco range when undergoing your derma CIT treatments. Thank you to Laser Effect in Newcastle for the treatment image and to House of Maxx in Armadale for the treatment video.